When I was about seven years old, I saw the film National Velvet. It set me on the path of becoming a passionate lover of horses. While Velvet might have only had one imaginary horse at a time, I had herds. In winter I rode imaginary Lipizzaners to school, and in summer I was the only girl who could commune with the wild horses that travelled everywhere in my imagination. And whenever my friends and I played a game that was set in motion by me, the theme was consistent. It involved horses, and reasonably invariably, one or other horse would become ill or injured and would need to be brought back from the brink of death before the vet put it out of its misery. These games were so elaborate and vivid in our young minds, that we wept real tears over our desperate imaginary equines. Now, when I look back at that time of my life, in my mind’s eye I see all the little girls everywhere (and maybe some boys, too) who played similar imaginary games. I see, rising from their fervent fantasies, an extraordinary energy and power rising up and gathering together, a potential like a stored up prayer, waiting to be put to use. 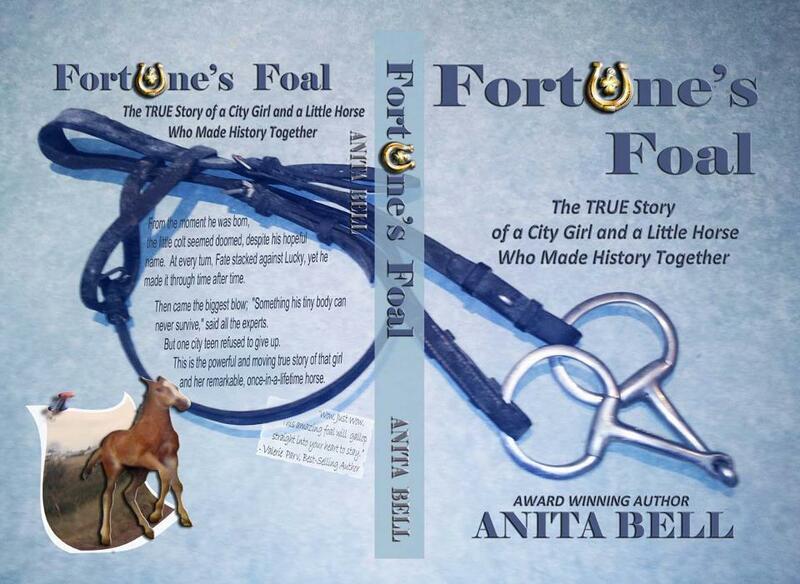 I have turned the final page of Anita Bell’s story, Fortune’s Foal, and I have been granted a strange and joyous privilege. I have watched backwards in time, as my childhood fantasy of healing desperately ill horses, after seven years of careful storage in whatever realm such things are stored, found its way from South Africa to Australia. It gathered and coalesced around a teenager who needed all the magick imaginable to live out the story and save a little foal from certain death. Not “almost certain”, please note. There is no “almost” to qualify this. There were no modern stories of horses surviving this disease, because the prognosis was so bad that they would be destroyed to end their suffering. If the disease did not kill them, which, without intervention it would, then humans killed them, out of mercy. Anita’s account of her journey with her horses, and particularly Lucky, is a page turner from beginning to end. What a young lady (yes – young lady without “listen here” appended) of courage and strength of will! While she gives the credit for strength of will to her colt many times in the story, it has to be noted that she and that colt matched each other every step of the way. The story stretches out into the community around the unfolding drama, turning strangers into friends, and grumpy folk into angels of kindness. What’s more, the strands of this story have not ended but continue to unfold in every hour of Anita’s life to this very day, for it’s her story. Given that it’s Anita’s story, it is inevitably told with delightful wit and self-deprecation that anyone who has communicated with Anita in any way will recognise. What I imagined as a child at play, Anita lived in painful and joyful detail, and it is so much more than I imagined, so much bigger, so much more triumphant and far-reaching. All I can say is thank you, Anita, for making my dream a reality, for saving Lucky, and please pass him an apple for me. ~ by Dragonwyst on May 9, 2013.